Gynecomastia (commonly known as “male breasts”) affects men on much more than a cosmetic level. The social stigma with men having excess breast skin or enlarged breast tissue can be psychologically damaging and physically uncomfortable. Men who struggle with gynecomastia are often ridiculed for their chest contour or appearing out of shape due to the size of their breasts. This condition is typically attributed to genetics rather than lifestyle choices, so even adopting a vigorous exercise regiment and sticking to a strict diet may not correct the problem. Many men can become depressed as a result of the body insecurities caused by gynecomastia that cannot be easily remedied with lifestyle changes. Creating a firmer, flatter chest aesthetic provides an instant boost of self-esteem for men who suffer from gynecomastia. Having a flatter chest as a result of male breast reduction surgery allows patients to wear more fitted clothing, go shirtless at the beach or pool, and not shy away from social interactions due to low self-esteem. For most men, being compared to the female form is not a compliment. Unfortunately, many men who have gynecomastia are made to feel as though their body shape is not compatible with their gender. Male breast reduction removes the excess fatty tissue from the chest, giving men the option to show off a flatter chest and a more sculpted physique. Men who opt for male breast reduction surgery can enjoy their new, masculine chest and rid themselves of the insecurities they once struggled with. Having a larger chest with more fatty tissue makes physical activity uncomfortable, which is something many women can relate to. Exercises, such as running and jumping, become more difficult and embarrassing if you are aware of the movements of your chest. While women can choose from a variety of special athletic bras that help hold their breasts down and prevent painful movement during exercise, men do not have the same options. Reducing the size of the chest allows male patients to feel comfortable engaging in physical activity again, which helps motivate them to stay fit and maintain their stronger, firmer figure. Having a more substantial chest can have a dramatic effect on one’s posture, causing the upper spine to become rounder and disfigured. Over time, this can lead to a permanent hump and chronic spinal pain. Another consequence of poor posture is compromised core strength and a withdrawn or reserved appearance. Sometimes, it is not the weight of the breasts that causes slouching, but men with gynecomastia may hunch their backs to hide their chest. 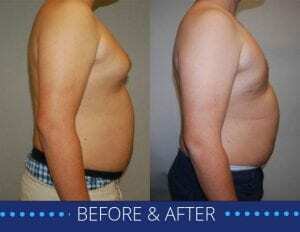 With a smaller chest, patients can stand straighter and taller, exuding confidence and approachability. The mind can flood itself with negative thoughts, especially when someone is self-conscious about their body. Men with gynecomastia may experience intense levels of anxiety throughout their day when considering what to wear, how to hide their chest, and whether anyone has noticed their breasts. Men who opt for male breast reduction can alleviate these worries and free their minds of constant uneasiness so that they can enjoy their lives and social interactions. Most male breast reduction patients report experiencing a heightened quality of life and emotional relief after their treatment. If you suffer from gynecomastia and want to learn more about male breast reduction, please schedule a consultation at Coastal Plastic Surgeons by calling 858-365-3558.